Attended a wonderful mommy blogger event today on the gorgeous campus of DreamWorks in Glendale, California that my kids and I were invited to. This was in advance of the release of Kung Fu Panda 2 , the latest movie dreamed up by DreamWorks. I'll be giving you all the deets next week about what was in the awesome goodie bag we received and all about the behind the scenes tour we had there including the healthy and luxe kid-friendly lunch that was served this afternoon. Will also be posting a review of the movie which will be in theaters nationwide next weekend, so subscribe to MommyBlogExpert.com now -- if you don't already get notified when new posts go up -- so you'll be the first to know when those posts go live. FTC Disclosure: I attended this event at the invitation of DreamWorks to screen Kung Fu Panda 2 for an upcoming movie review. 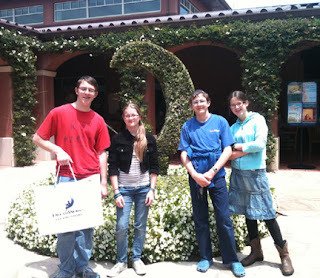 My family and I also received a lovely lunch, behind the scenes tour of the DreamWorks campus and a goodie bag. However, MommyBlogExpert did not receive any payment or other compensation associated with this post. See complete FTC Disclosure information that appears at the bottom of MommyBlogExpert's main page and at the bottom of every individual post on this blog, including this one.